If you haven’t yet tried a Green Smoothie, don’t be afraid or turned off by the color. 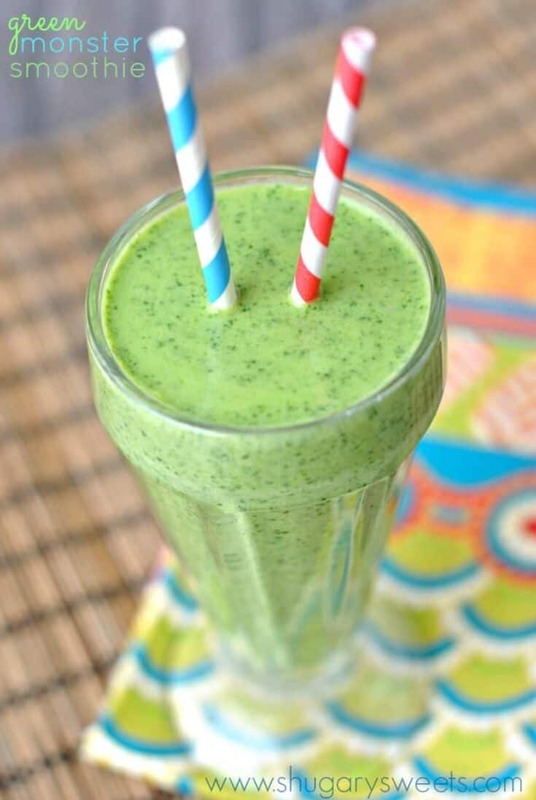 These healthy, easy Green monster smoothies are energy boosters and delicious too! As for my workouts, I’m still going strong, if you’re wondering. Do you follow me on instagram? Then you may have noticed I made this green smoothie after my last p90x workout. But before we talk about this tasty smoothie, let’s talk workouts. I’m curious, for those of you who workout at home…what do you do? Are you a dvd watcher? Run on a treadmill in your basement? Do you write your own routine? I have a gym membership that I barely use in the winter. I’ll go for a week, then quit going and workout at home for two months before going back to the gym. I never thought I would enjoy working out at home, but two years ago we bought p90x and started the program. I hate love it. It’s a great home workout. I also have a couple Jillian Michael’s body shred DVD’s as well as some Bob Harper Kettleball workouts. But now I’m hearing of this T25 and I’m totally intrigued. Not that I need to spend more money on a workout, but I do enjoy having variety at home! So basically, I’m putting out a request, tell me YOUR favorite home workouts. If it’s a link, share it!! What is a Green Monster Smoothie? Typically, green smoothies are packed with healthy fruits and vegetables and have a vibrant green color. But don’t let that color scare you, as with my recipe you can’t taste the spinach. The health benefits of smoothies are perfect for people who work out or need breakfast on the go. For me personally, I’m not a breakfast person, but I like to get in some calories and protein within 30 minutes of a heavy workout. Green smoothies are the perfect healthy breakfast! They taste good and are quite refreshing! But first, grab your blender. You’ll add fresh spinach, a handful of ice, and milk. 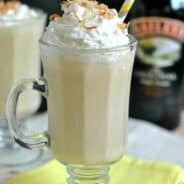 I use vanilla almond milk, but choose your favorite variety. Next add in about 6 oz yogurt (vanilla greek yogurt is my go-to for smoothies). You’ll also need one banana (fresh or frozen), and 1/2 cup peaches (fresh, frozen, or canned). If desired, add a scoop of vanilla protein powder. Blend and process until smooth and creamy! If using frozen fruits, you may need an extra splash of milk. This makes a very large smoothie, which you can share or enjoy solo! I love to change up the variety of fruits in my smoothies, but my very favorite green smoothie is this one! 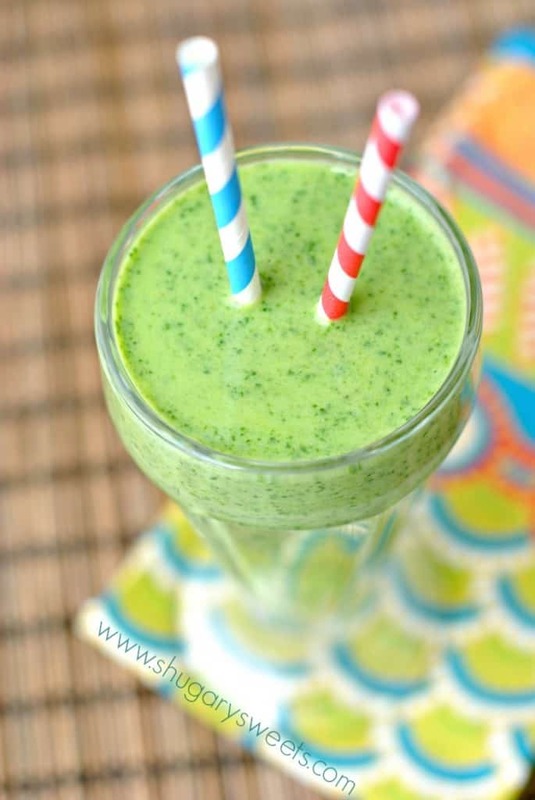 With banana, spinach and peaches; it’s so refreshing and delicious! Say you don’t like spinach? Any leafy greens will do, but kale is a great alternative to the spinach. I’ve also added some Vanilla whey protein powder into my smoothie, this is totally optional! I love having this extra protein boost in my diet, it makes this smoothie a meal replacement! Great add-ins would also include a scoop of almond butter or chia seeds. Both have health benefits and help create a smooth and creamy texture! A blender. A good powerful blender is key to making smoothies. One that burns up and doesn’t blend the frozen ice and chunks of fruit is just a headache. So give yourself a gift of a good blender! Love smoothies? 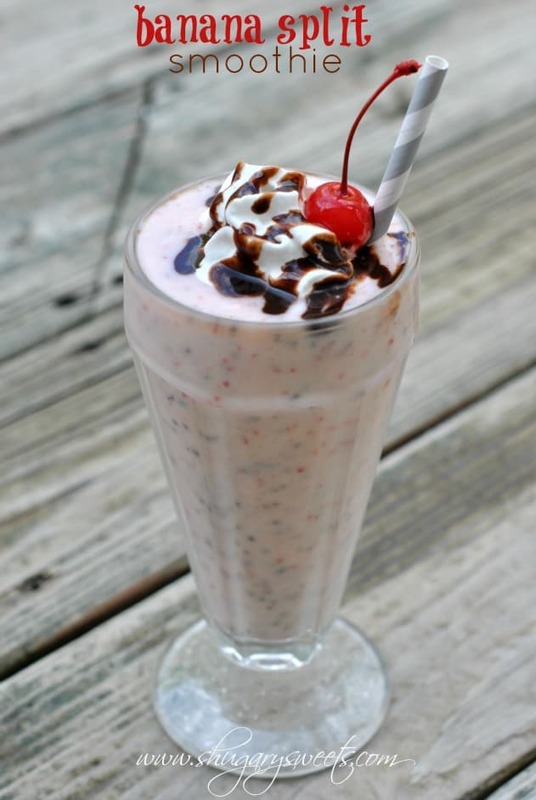 This Banana Split Smoothie is one of my favorites! Be sure to check out my Getting Fit and Healthy Pinterest Board! If you haven't yet tried a Green Smoothie, don't be afraid or turned off by the color. These healthy, easy Green monster smoothies are energy boosters and delicious too! In a large blender, combine all the ingredients above. Process for 3-5 minutes. You want to go this long to make sure the spinach is fully blended. ENJOY. LOVE green smoothies! So versatile and delicious. 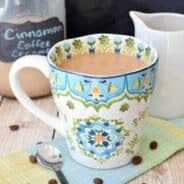 Favorite home workouts = Sara Ivanhoe 20-minute yoga solution DVDs; ToneItUp.com (free YouTube videos found there); Blogilates.com (even MORE free workout videos). I’ll have to check into those!! Love green smoothies and you’re right about not being turned off by the color. You can’t even taste the green. I doctor mine up with banana, and any frozen fruit from pineapple to mango. Love that you put greek yog in yours. pinned! 10,000 kettle bell swings? I am exhausted just thinking about that. Of course that will be my routine come next week. I love green smoothies too! OMG it’s such a good workout. Today I did 100 swings, 50 ab crunches, 10 minute run on treadmill, repeated 3 times…then through in an extra 100 swings at the end. I’m dying…. I love how refreshing this smoothie looks! Sounds fab too! Pinned! I love this combination for a green smoothie. I’m excited to try it. I tend to get in a rut with my smoothies. And my workout DVD’s. I like to mix it up too. My favorites, though, tend to be Leslie Sansone’s Walk Away the Pounds. I work out 4-5 days a week at the gym but I used to do p90x abs to supplement it before I started doing pilates. My mom is currently on a p90x kick! Is it just me or do you think the yoga is surprisingly harder than expected? As for the smoothie, it looks so yummy! Been craving one but it’s been far too cold, even here in Louisiana! Do i have to use protein powder and if so what is a good kind to buy and where? Next step at the vitamin Shoppe, chocolate or vanilla. Awesome stuff!! Can you tell me how much protein powder you use for the monster smoothie ? Can you give me the name of a good one ? I need to get back on the workout grind! Go you for getting it!! This smoothie does look delicious, I could drink a few of these!! Adding lime sounds amazing! 400? Wow, you go girl! And your photos are gorgeous! I hate photographing smoothies, milkshakes, parfaits, etc, but you did an incredible job with these. I really want to dive right in. For workouts? I used to run, but now I just do things our personal trainer gave us … they’re just on a sheet of paper, so I assume he made them up. Sorry that isn’t much help at all! I hate photographing drinks too, thanks for the sweet words! I’m on such a smoothie kick and this just might be my lunch today! Yummy! Lol…I am scared of green smoothies. I think I like the idea more than anything. I pin a billion recipes but never make them. I need to try yours. It’s the most sane one I’ve seen (if that makes sense). This sounds fantastic, Aimee! I’ve been making green smoothies for the past 3 weeks and we have our share of bad combos so I’m always on the lookout for stellar recipes. This one sounds refreshing. I can’t wait to try it– writing ingred. on my farmer’s market list now! My favorite home workouts are Jillian DVDs and going out running. I have to force myself out the door for a run, but always love it once I’ve begun. We start each morning with a green smoothie at our house – lucky for me my husband gets up early and makes them before he heads to work. This one looks yummy!! I love green smoothies. This one looks so refreshing!! When I’m at home, I run on my treadmill and watch something on Netflix on my I Pad. Otherwise, I am on a team fitness program at Lifetime. I love it! I have met a lot of great friends through it and when I don’t do it, I am NOT consistent with working out at all!! Can these be frozen to make them easier for grab and go somedays?! Have you tried it or is fresh best?! 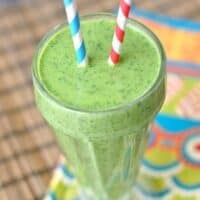 I love this Green Monster Smoothie! After a long run I like to drink no only water but after I cool down a bit something a little different but healthy. This sounds perfect! Thank you for providing a great idea, I can’t wait to try this! I’m with Bev…has anyone tried to prep ahead? Sounds delish! I haven’t done that, let me know if you try! I’ve never tried a green smoothie (probably the only person who hasn’t!). I’m not sure I can imagine drinking spinach, but love that your version includes peaches! I should add that mine don’t look nearly ss appetizing, though (unless you like gray drinks). T25 is one of my favorites! Very different than Insanity, which I love. You move non-stop for the full 25 minutes. A great workout and the whole program comes with 12 DVDs so you won’t ever get bored! Always follow it up with a healthy and good quality protein smoothie! 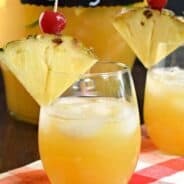 This is a fantastic smoothie recipe 🙂 I can’t wait to try it out! turbo fire is a blast, insanity is crazy insane but fun, chalean extreme is awesome I love the weights, jillian micheals 90 day is good, I love to have different ones so I don’t get bored with the workouts. thanks for smoothie ideas. Try this workout if you have a pullup bar. Set a timer for 30 minutes. Do 3 pullups or chinups, 10 pushups, 10 speed situps or other core exercise. Do as many rounds as u can in the 30 minutes. OR: put 40 coins on a table and move one after every round and do the workout throughout the day until all 40 coins have been moved. I love T25! How can you say no to 25 minutes a day? I’m a Beachbody coach and there is a new program on the scene called the 21 Day Fix. It looks to be really great! I’m not a gym person at all, I’m intimidated, so home DVDs are my preference. Green smoothies are a great way to get all that good stuff in and they are actually great. I prep mine when I get home from the grocery, packing 2 c. spinach or kale into baggies, and fruits cleaned & chopped into snack size baggies by 1 c. so I can change things up. I do 2 c. green, 3 cups fruit, 2 c. liquid ( water, oj, almond milk or a combo) and always start with just liquids and green, this get sit smooth before adding the fruits. This makes 32 oz., I drink one immediately and stash the other in the fridge or split between my kiddos. This makes it easy to get out every morning, and I don’t have to add ice, since my fruits and greens are frozen 🙂 I’ve been avoiding work outs for 4 years my goal is to get back in shape, did a 30 day challenge in January with green smoothies and now I am slowly trying to start the work outs. I have the T25 DVD’s…love them! 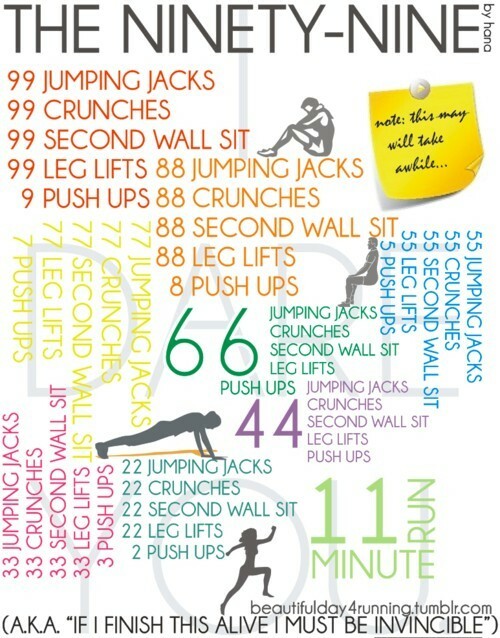 (a great workout in 25 mins) and add them to my rotation of videos. I don’t go out to the gym so have to find my motivation at home. Jillian M’s “No More Trouble Zone’s” rocks it for a great all round workout that helps you shed inches, and get toned. I’m back to the treadmill while I watch Netflix to help me get through a couple miles. Exercise is soooo mind over matter – hate it, but love how I feel after. I need to try your green smoothie…it looks great! Wao.i pinned this and m gonna try it???? So I have done lots of the beach body workouts- I got tired of buying all the dvds, so I do the beach body on demand now. You can do insanity, all of the p90’s, 21 day fix, 80 day obsession, lift 4, etc. I think when I signed up it was like 100 for the year. And I don’t buy the stuff when it comes out!! Oooh good to know, thank you!